There were 14 people on the trip, and 2 tour leaders, Jeri M. Langham and Shawn Hayes. The itinerary, copied from the VENT website and copyright by Victor Emanual Nature Tours, follows. July 7, Day 1: Arrival in San José, Costa Rica. Upon arrival in San José, Costa Rica, you will be transferred to our hotel, the El Rodeo Country Inn. Those who arrive early should meet Jeri in the El Rodeo Hotel lobby at 7:00 PM and join him for dinner and/or coffee and dessert at the nearby steakhouse. Plans for the next morning will be discussed. If you arrive on a later flight, please have the front desk call Jeri’s room, and he will come down to give you all necessary information about the following morning. July 8-9, Days 2-3: San José to Carara Biological Reserve. Established in 1978, Carara is one of Costa Rica’s well-kept secrets. It is located near the Pacific Coast in a transition zone between the dry northwest and the very humid southwest. Today, this 7,600-hectare reserve of tall, humid forest is virtually the only wet/dry transition (mixed) forest remaining in the Pacific lowlands. Almost all of the reserve is original forest. We’ll leave early for Carara, arriving in time to spend a full morning walking on forest trails. Besides providing one of the most pleasant forest walks of our entire trip, Carara offers a mix of birds that is both unique and fascinating. This will be our best chance to see Scarlet Macaw, a spectacular symbol of wildness, declining in many parts of its range because of habitat destruction and trapping for the cage-bird industry. With luck, we might locate a lek of colorful Orange-collared Manakins—the displays of these dazzling sprites are among the most entertaining spectacles available to visiting birders. Trogons abound, with Baird’s, Slaty-tailed, Blackthroated, and Violaceous all possible. Present, too, are many of the southwestern specialty birds, near this northern limit of their ranges, including Fiery-billed Aracari, Yellow-billed Cotinga, Black-hooded Antshrike, and Riverside Wren. Other species of interest include Streak-chested Antpitta, Chestnut-backed Antbird, Dotwinged Antwren, Thrush-like Schiffornis, Stub-tailed and Golden-crowned spadebills, Cherrie’s Tanager, Rufous- naped Wren, and many more. We have two full days in the Pacific Slope paradise. On one or both days we’ll visit marshes, mangrove swamps, and tidal flats near the mouth of the Rio Tárcoles, an area teeming with herons, gulls, terns, and shorebirds. July 10, Day 4: Carara to Monteverde. This morning we will depart for Monteverde, a three-hour drive that takes us up through denuded foothills to the edge of the forests of the Cordillera de Tilarán. The cloud forests of Costa Rica (and far western Panama) are a major center of endemism in Central America and contain many unique forms not found elsewhere. Birds in the vicinity include Rufous-and-white Wren, Orange-billed Nightingale-Thrush, Mountain Robin, Golden-crowned Warbler, White-naped Brush-Finch, and White-eared Ground-Sparrow. By the end of the day, we will have experienced the incredible extravaganza at the Hummingbird Gallery, where about eight species, ranging from the huge Violet Sabrewing to the small, endemic Coppery-headed Emerald, will swirl around our heads and sometimes perch on our fingers. July 11-12, Days 5-6: Monteverde Cloud Forest Preserve. Monteverde is one of the highlights of any Costa Rica trip. We will spend two days here in the enchanting cloud forest, where great sheets of mist peel off the lush slopes to envelop the epiphyte-laden trees in a blanket of moisture. The profusion of plant life is almost unbelievable. Some of the finest birds of Central America inhabit this unique reserve, and a fine trail system allows easy access to their habitat and good visibility into it. Here we will search for the fabulous Resplendent Quetzal, Barred Hawk, Black Guan, Orange-bellied Trogon, Purple-throated Mountain-gem, Prong-billed Barbet, Blue-throated Toucanet, Streak-breasted Treehunter, Golden-bellied Flycatcher, Azure-hooded Jay, Graybreasted Wood-Wren, Golden-browed Chlorophonia, Spangle-cheeked Tanager, and more. The incredible calls of displaying Three-wattled Bellbirds are the dominant forest sound, while a beautiful chorus of solitaire and nightingale-thrush songs drift through the undergrowth. We may also be fortunate enough to see Copperyheaded Emerald and Wrenthrush. The former is a true Costa Rica endemic, thus found in no other country. The odd Wrenthrush, of uncertain taxonomic affinity and formerly placed in a family of its own, is now regarded as a paruline. July 13, Day 7: Monteverde to Arenal Observatory Lodge. A final morning in the Monteverde area allows us to pick up anything we may have missed. After breakfast at Hotel Fonda Vela, we will depart on a 5.5-hour drive down the mountain to the town of Tilarán and ride around Lake Arenal to Arenal Observatory Lodge near La Fortuna. We will bird along the way. Arenal was added to this tour after being visited by Jeri and his family in 1998. Most rooms at Arenal Observatory Lodge face the huge Arenal Volcano cinder cone. It usually erupts several times each day. If the cone is not enclosed by clouds, the daytime eruptions create a large plume of ash that rises dramatically into the sky. The real attraction is at night, however. At that time orange-glowing molten rocks that have been spewed out roll down the cinder cone. It is an unforgettable experience. Our two nights at this wonderful lodge maximize our chances of seeing a nighttime eruption. July 14, Day 8: Arenal Observatory Lodge and Lake Arenal. Early-morning and late-afternoon bird activity along the road bordering Arenal Lake is quite enjoyable, and the trails in the large patch of rainforest next to the lodge offer interesting birding during the day. If any want to try horseback riding, horses can be rented here for any number of hours. The group will spend the morning and afternoon in forests near the Arenal Observatory Lodge. July 15, Day 9: Arenal Observatory Lodge to Selva Verde Lodge via La Virgen del Socorro. After an early breakfast, we will bird our way south along the Caribbean slope to the colony of La Virgen del Socorro, one of Costa Rica’s most productive birding locations. We will visit a small restaurant above La Virgen del Socorro that will provide us with another hummingbird experience that rivals the Hummingbird Gallery at Monteverde. After lunch at La Paz Waterfall Gardens, we will return to La Virgen del Socorro for an afternoon of searching for middle-elevation specialty birds. Our goal is to reach Selva Verde Lodge by dinner. Recently, this lodge built a bridge across the Sarapiqui River. In late afternoon in 1998, we saw 27 Great Green Macaws from this bridge—more than all previous tours put together! The grounds of the Selva Verde Lodge are excellent for birding, especially near the fruit feeders set up around the buildings. Come see for yourself! July 16-17, Days 10-11: La Selva Biological Research Station. Today, we bird the lowlands of northeastern Costa Rica, which contain undisturbed tracts of tall rainforest. Most of our time will be spent at La Selva Biological Research Station run, by the Organization for Tropical Studies (OTS). This area’s diverse habitats include virgin forest, tall second-growth forest, over-grown plantations, and successional thickets. The avifauna is large, and just a few of the birds that we may see or hear include Great, Slaty-breasted and Little tinamous; Semiplumbeous Hawk; Black-and-white, Crested (very rare), and Spectacled owls; Slaty-tailed Trogon; Amazon Kingfisher; Broad-billed and Rufous motmots; White-whiskered Puffbird; Chestnut-colored Woodpecker; Black-striped Woodcreeper; Western Slaty Antshrike; Chestnut-backed Antbird; Red-capped and Whitecollared manakins; Long-tailed Tyrant; Stripe-breasted and Black-throated wrens; Shining Honeycreeper; Montezuma and Chestnut-headed oropendolas; Scarlet-rumped and Yellow-billed caciques; Dusky-faced Tanager; Orange-billed Sparrow; and many more. Rarities that we will pursue include Lattice-tailed Trogon and forest raptors. Always desired is an encounter with an army ant swarm and attendant “professional” followers—Ocellated, Bicolored, and Spotted antbirds, along with Northern Barred and Plain-brown woodcreepers. July 18, Day 12: Braulio Carrillo National Park and Rainforest Aerial Tram. Today we will have a full day to explore this park and an adjacent 1,100-acre private reserve. Both are not far from Selva Verde, so we will devote all day to the unforgettable 90-minute Aerial Tram ride and portions of the preserve. The tram ride enables us to traverse all levels of a Caribbean foothill rainforest canopy and walk the rainforest trails on this privately owned property. Created in 1978, Braulio Carrillo National Park encompasses a huge band of wet Caribbean foothill forest. In 1987, the road was finally completed, and the park opened to the public. Now birders have access to some of the country’s rarest, least known, and most restricted species in this fabulous area of steep forested slopes, cloud filled valleys, and plunging waterfalls. In the lower part of the park, one might see Green-fronted Lancebill, Snowcap, Yellow-eared Toucanet, Rufous-winged Woodpecker, Immaculate Antbird, White-ruffed Manakin, Rufous-browed Tyrannulet, and Tawny-capped Euphonia. We will also search for an absolutely stellar line-up of tanagers, such as Emerald, Silver-throated, Speckled, Spangle-cheeked, Blue-and-gold, Black-and-yellow, Olive, and Tawny-crested, as well as White-throated Shrike-Tanager. Many other birds also occur, but for various reasons, the chances of seeing them are vanishingly small. Nevertheless, just being where they occur and knowing that one of them could turn up is exciting. This remarkable group includes Tiny Hawk, Violaceous Quail-Dove, Rufous-vented Ground-Cuckoo, Black-crowned Antpitta, and Bare-necked Umbrellabird. Finally, because this amazing region is so extraordinarily wet, several life zones are actually compressed into a very narrow vertical range of elevations. A short drive up the road to higher elevations consequently brings an entirely new set of birds. For example, an upper zone sample might contain Fiery-throated Hummingbird, Prong-billed Barbet, Buffy Tuftedcheek, Tufted Flycatcher, Azure-hooded Jay, Ochraceous Wren, Black-faced Solitaire, and Sooty-faced Finch. The number of high-quality birds in this region is astonishing, but birding here is difficult—rain and fog are frequent problems, and currently some of the most productive trails are off limits. July 19, Day 13: Sarapiqui to San José via La Virgen del Socorro and Volcan Poás. En route to San José, we will return to the subtropical foothill forest near La Virgen. This is one of the wettest forest types in Central America and is the home of many special birds not found above or below this zone. The birds here roam in mixed flocks, and among the species that we may encounter are Red-headed Barbet, Spotted Woodcreeper, Spotted Barbtail, Russet Antshrike, Tawny-capped Euphonia, Scarlet-thighed Dacnis, Emerald Tanager, and Sooty-faced Finch. Foothill rarities like Black-crested Coquette and Lanceolated Monklet also have been seen here. For every walk along this unpaved road, the bird activity is different. Our lunch is scheduled for the La Paz Waterfall Gardens’ restaurant, whose hummingbird feeders are phenomenal: the endemic Coppery-headed Emerald and rare Green Thorntail are usually abundant, but we have also seen Brown and Green violet-ears, Whitebellied (rare) and Purple-throated mountain-gems, Violet-headed Hummingbird, the huge Violet Sabrewing, Black-bellied Hummingbird (rare), Violet-crowned Woodnymph, and Green-crowned Brilliant. If it is not raining when we reach the top, we will take a side-trip to Volcan Poás, hoping to get a view of the crater and seeing such high mountain specialties as Fiery-throated Hummingbird, Large-footed and Yellowthighed finch, Black-billed Nightingale-Thrush, Black-and-yellow Silky-Flycatcher, and others mentioned for the high elevations at Monteverde. The Volcan Poás crater is usually engulfed in fog and not visible, but with luck we may see the most acidic lake in the world (pH of zero). There is a wonderful trail through elfin forest that we will also walk. Sometimes the rare and skulky Wrenthrush (Zeledonia) can be found here. July 20, Day 14: Departure for home. We will be transported to the San José airport this morning for departing flights. 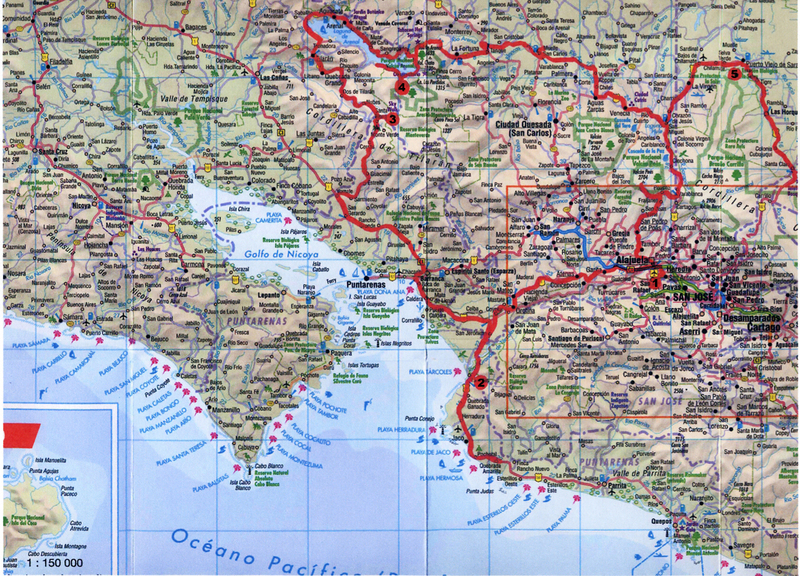 Map showing route traveled in Costa Rica and location of hotels.